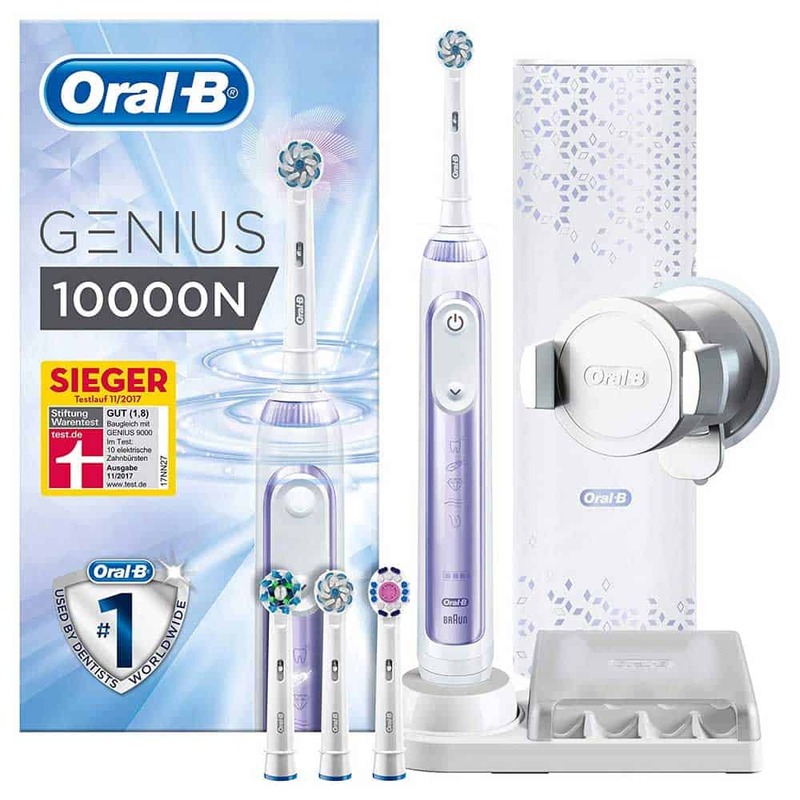 Please note that if you’re a UK user, the Genius 9000 is still the flagship Oral-B brush — there is little difference between the 9000 and the 10000 (as we explain in more detail below), but the 10000 has launched in some European countries. We have completed a comparison of all the UK Genius models here. 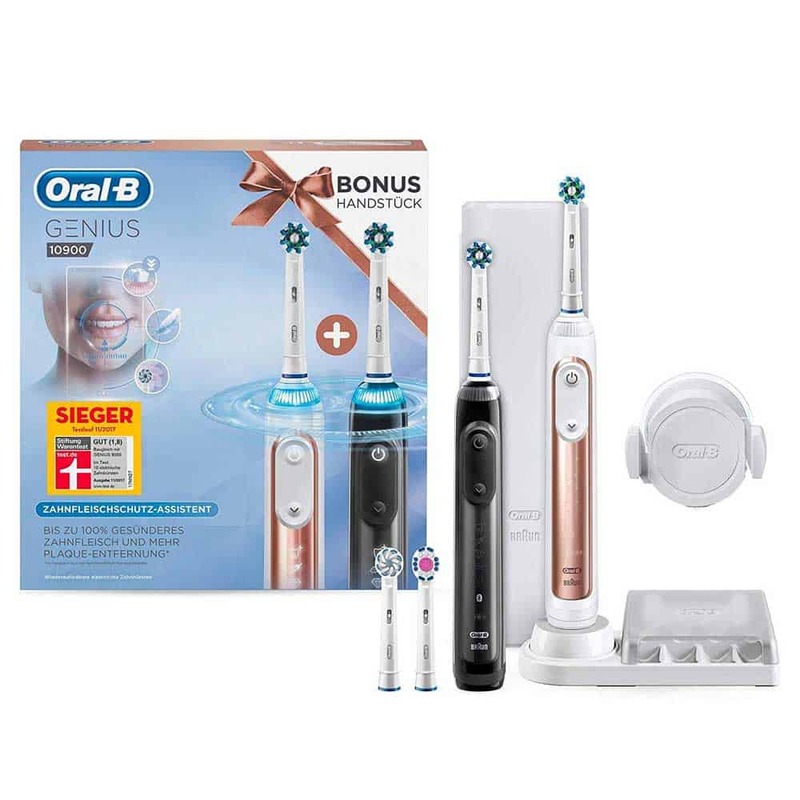 Oral-B have a wide variety of electric toothbrushes, ranging from the basic, functional and very affordable, right through to the more premium, feature rich and fairly expensive. The Genius 10,000 is the latest brush to be added to this lineup and it sits firmly at the premium end of the range. If you are reading this article, I suspect you are wondering whether it is worth buying and how it differs from other models that already exist. I intend to answer these questions for you. 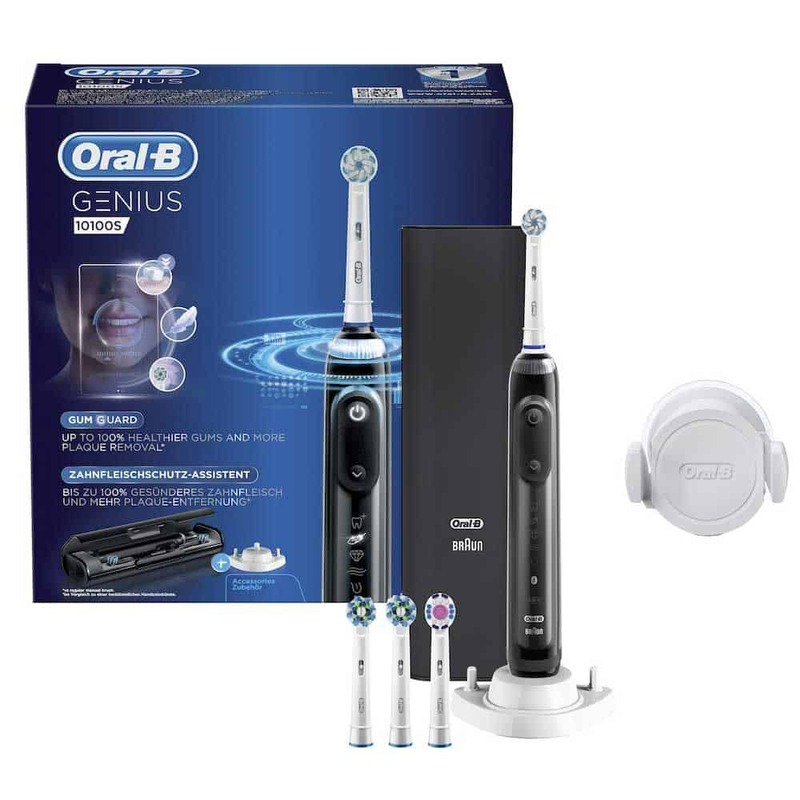 The Genius 10,000 is a top of the line electric toothbrush. It has lots of features and extra box contents that add to the experience, but are far from essential. For most, the Oral-B Pro 2 2500 is the perfect brush, striking a balance between features and price. However, if you desire the very best Oral-B toothbrush, then this is it. Compared to the Genius 9000, it is essentially identical. Subject to your location, brush colour, price and potentially box contents is what sets these 2 brushes apart. Existing owners of the 9000 should not upgrade and those looking at the two should buy whichever is cheapest and comes in the colour you prefer. Please note: The Oral-B range is very confusing and differs from country to country. If you can spare the few extra minutes, it is worth reading the remainder of this article to fully understand the 10,000 and what it offers. 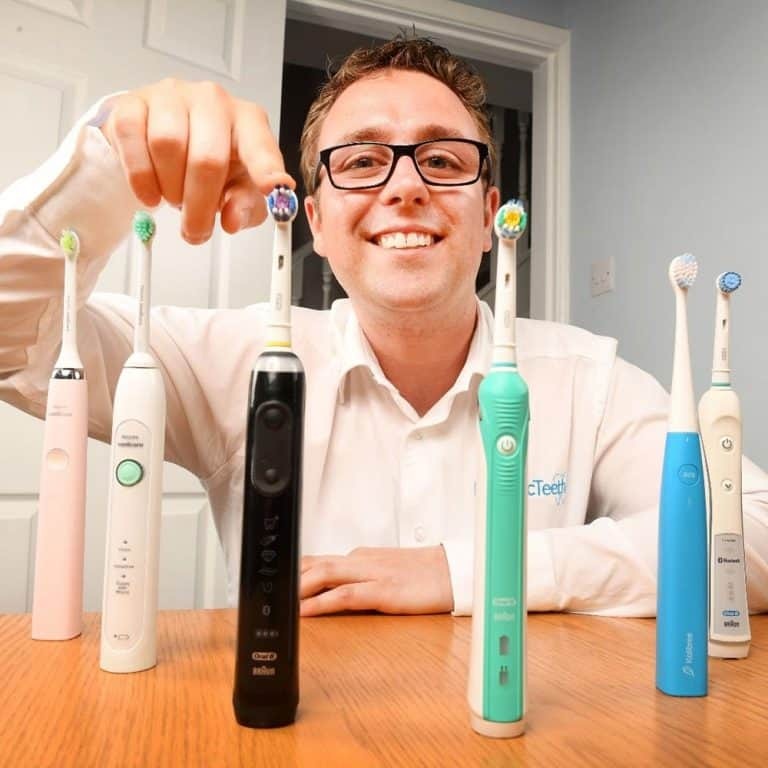 Having been reviewing, testing and commenting on electric toothbrushes for 4 years now, I have learnt that the leading brands do not make your decision process simple when it comes to choosing an electric toothbrush. The introduction of the Genius 10,000 is a perfect example of this. I will do my best to explain the Genius 10,0000 and all associated information as clearly as possible. I have done my best to ensure that the details provided are accurate, but the brushes, box contents do vary from 1 country to another, so there may well be some inaccuracies. If you are unsure or have any questions, please leave them in the comments section at the end and I will reply as soon as possible. The Genius 10,000 was launched in late 2018. It is available for purchase within most central European countries such as France, Germany, Switzerland, but at the time of writing it has not launched within the UK, the country that I live in. According to Oral-B, the 10,000 was launched to celebrate the introduction of new colours, not previously available. Those colours are orchid purple and midnight black (this is where the brush heads are black too – not previously the case on other ‘black’ coloured Oral-B brushes). In addition, the 10,000 gains ‘gum protection technology’ and a different accessory pack. Before the 10,000 was launched, it was the Genius 9000 that was the top of the line electric toothbrush from Oral-B. The 9000 was launched in 2016. In some respects, as the model number suggests the 10,000 is superior and is the new replacement to the 9000. However, whilst it might seem this way, this is not quite correct. Excluding price, brush colour and some accessories in the box, the Genius 9000 and the Genius 10000 are identical. Both models have the same cleaning modes, the same smart ring, the same battery life, the same built in timer and pressure sensor, use the same brush heads and both have the same Bluetooth connectivity. The ‘gum protection technology’ which is touted as ‘new’ is actually a feature of the smartphone app. The app has been updated and this is available to users of the Genius 9000 or 10,000. Even when we bring colour back into the equation, the 10,000 (within Germany at least) is not limited to the orchid purple and midnight black, it is also available in white and rose gold, 2 colours that the 9000 is available in. In the UK, the 10,000 has not been launched. 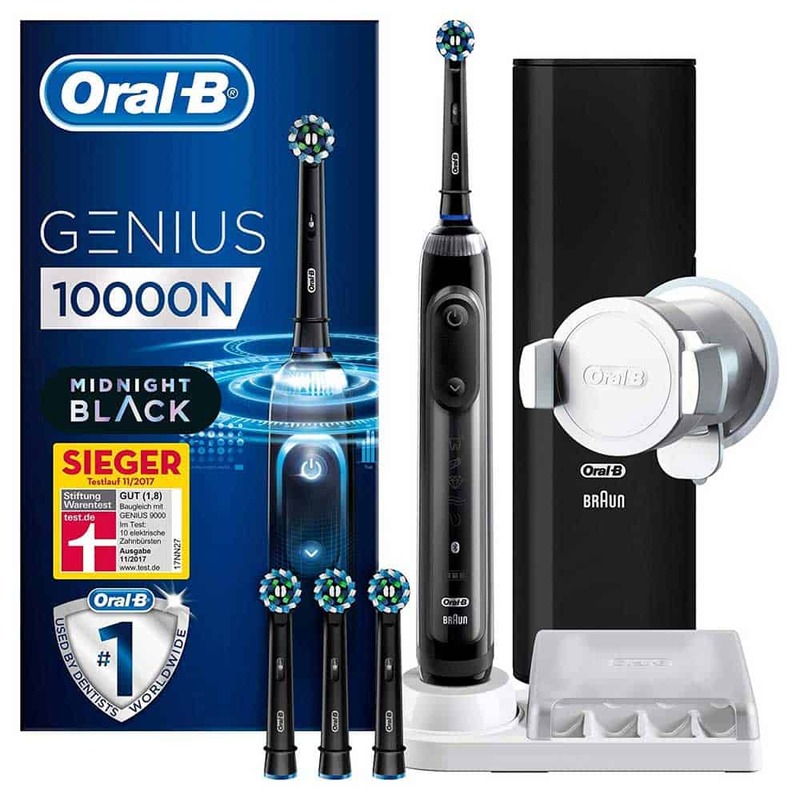 Instead, the Genius 9000 remains the flagship brush but the range of options has been increased to include the orchid purple and midnight black, the very colours that launched as the 10,000 in central Europe. Essentially, the approach in the UK and European countries differs. Having now learnt that the 10,000 is essentially a rebadged Genius 9000, what about the review and what it is like to use? Quite honestly, it is a bit of a waste of our time to review the 10,000 given it’s the same as the 9000 with the exception of colour and local availability. Therefore, if you want to read what the 10,000 is like to use on a daily basis, just read our Oral-B Genius 9000 review. Oh and in case you are wondering, we have updated the 9000 review to include our thoughts on the new ‘gum protection technology’, so you get all the info you need. Ready for things to get a little more complicated?! The 10,000 or as it is sometimes also referred to as, the 10,000N will generally come with the following box contents. Using Germany as an example, you can buy the 10,000 in white, rose gold, orchid purple and midnight black. But, if you buy the midnight black option, instead of 1 x CrossAction, 1 x 3D White & 2 x Sensitive brush heads, you actually get 4 x CrossAction brush heads, all of which are black in colour to match the brush handle. This is the EXACT same box contents as if you bought the Genius 9000! 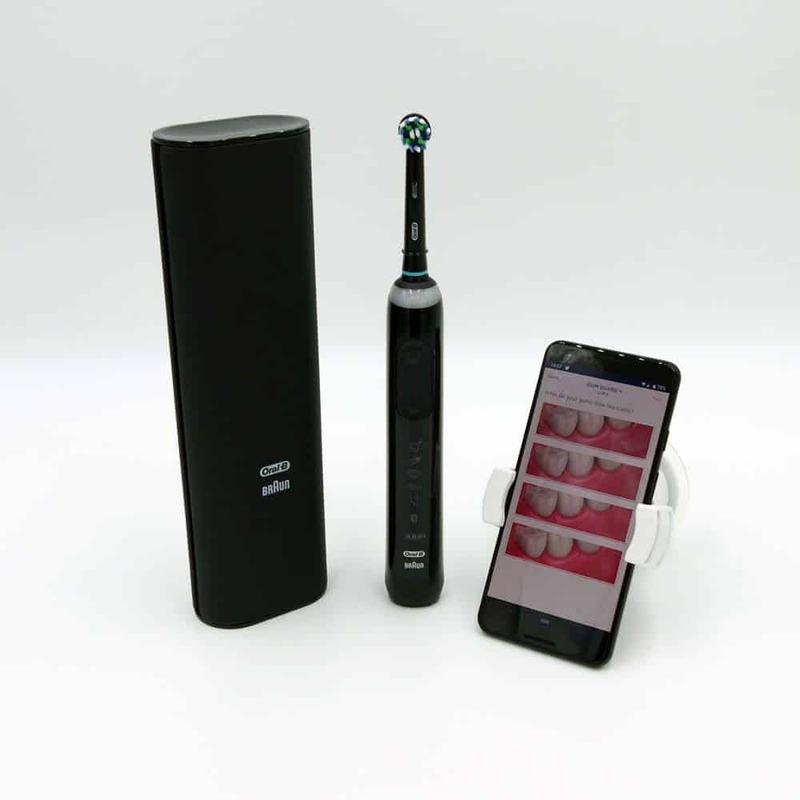 Oral-B have launched a promotional video (included below) for the 10,000 which actually shows a different charging stand to that actually provided in the box and shown in all other promotional images. In the video, they show the new style charging stand, with detachable power cable, but this is not included in the box, or at least it isn’t at the time of writing. A special edition model, this is the same as the 10,000N in midnight black, but you get included an Braun brown BNC015-RC digital global radio-controlled projection alarm clock. I already mentioned how things can vary from 1 country to another, so this might be different in France for example, but for the most part, this will be the same. Enter to the mix, the 10,100 (also known as the 10,100S) and the 10,900. As the name implies, the 10,100S is very similar to the 10,000N, but with the 100S the box contents is a bit different. You get 2 x CrossAction, 1 x Sensi UltraThin and 1 x 3D White brush head. Rather than the brush head storage compartment that held 4 brush heads under a lid, you just get a basic stand that holds just 2 brush heads. The 10,100S is available in white, rose gold, orchid purple and black (This is different to midnight black). It is my understanding that the 10,100S is most commonly found in Switzerland, but you are unlikely to find the 10,000N here. In this instance, rather than any brush head stand or storage compartment you get an additional pouch. This small pouch I believe is designed to hold things like the charging stand and/or the charger for the travel case. The 10,200W is available in white, rose gold, orchid purple and black (This is different to midnight black). This is a dual handle package, like the Genius 9900. 1 x Black (not midnight black) & 1 x rose gold brush handle. 2 x CrossAction, 1 x 3D White & 1 x Sensi UltraThin brush head. Essentially the same as the 10,900 listed above, but you get included an Braun brown BNC015-RC digital global radio-controlled projection alarm clock as well as a 2 extra brush heads, 1 of which is black in colour to match the brush handle. 3 x CrossAction (2 x white, 1 x black), 1 x 3D White & 1 x Sensi UltraThin brush head. If you have read all of the above you will have discovered that the Genius 10,000 and the Genius 9000 are technically identical. Oral-B suggests a box contents difference within some countries as well as possible brush colour differences. Using the German market as my basis for comparison, the ONLY differences I have found at the time of writing is the model name, that the orchid purple and midnight black are only available when buying the 10,000 and the price (only a few Euros between them). There is no noticeable difference in the actual parts included in the box with the 9000 or 10,000 in Germany. How does the 10000 compare to other models? For the most part, you can just read any comparisons of the Genius 9000 vs the other brush you might be interested in. Use the search box at the top of the page to find a comparison we have already written. Do just be aware that there may well be some regional differences. All being well this has helped answer any questions you may have. If you have any comments or queries, leave them below and I will respond as soon as possible. I am considering buying the 10900 or 9900 but since they are the same and I can’t find the 10900 available in Belgium it will probably be the 9900. I love the idea of two handles so my boyfriend and I can both use the newest techonology. Only problem is we don’t live together jet so I am wondering if the charger for the Genius lines is the same as the Pro vitality one? Thanks for the question. 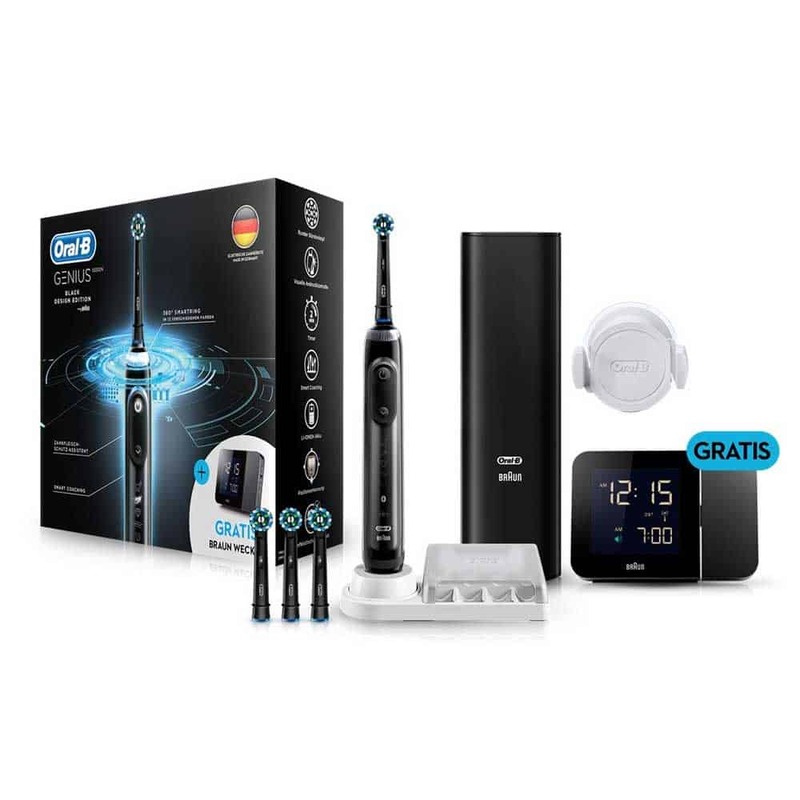 The chargers are the same across the Oral-B range so you can charge the Genius using the chargers provided with other models like the Vitality etc. Be sure to check the prices before buying. As odd as it may sound, it can be cheaper to buy 2 individually boxed units of the Genius 9000 than it is the Genius 9900. It doses depend on the retailer etc, but just worth checking before you spend your money. Thanks for the kind words and also for bringing the 10,200W to my attention. Having done a bit of research I think I know what the differences are. The 10,200W does not come with a brush head storage compartment. The 10,200W comes with a travel pouch designed for placing the charging stand/travel case power adapter (or anything else) inside. With the 10,000N you get 1 x CrossAction, 1 x 3D White & 2 x Sensi UltraThin brush head, but with the 10,200W you get 2 x CrossAction, 1 x Sensi UltraThin and 1 x 3D White brush heads. Hi, What is the type of usb socket that the travel case has? USB-C perhaps? Standard full size USB, not micro, mini or USB type c.
Thank you so much Elisha for the comment and kind words, it is great to know that I have helped. What do you think of your Genius 9000? Is the Lithium-ion battery improved on the new 10000? Hey. What do you mean improved? Compared to what? The battery will give 2 weeks usage time from a full charge. How can i get replacement black brush heads for the midnight black handle? I can’t find them on any websites. I’m U.K. based. As far as we are aware, the 10000 offers 10,5000 oscillations and 48,000 pulsations. Thank you for your answer. Is those numbers same as for 9000? Hi Jon! Is those numbers the same as Oral B 7000? Thanks in advance! What numbers do you mean exactly? 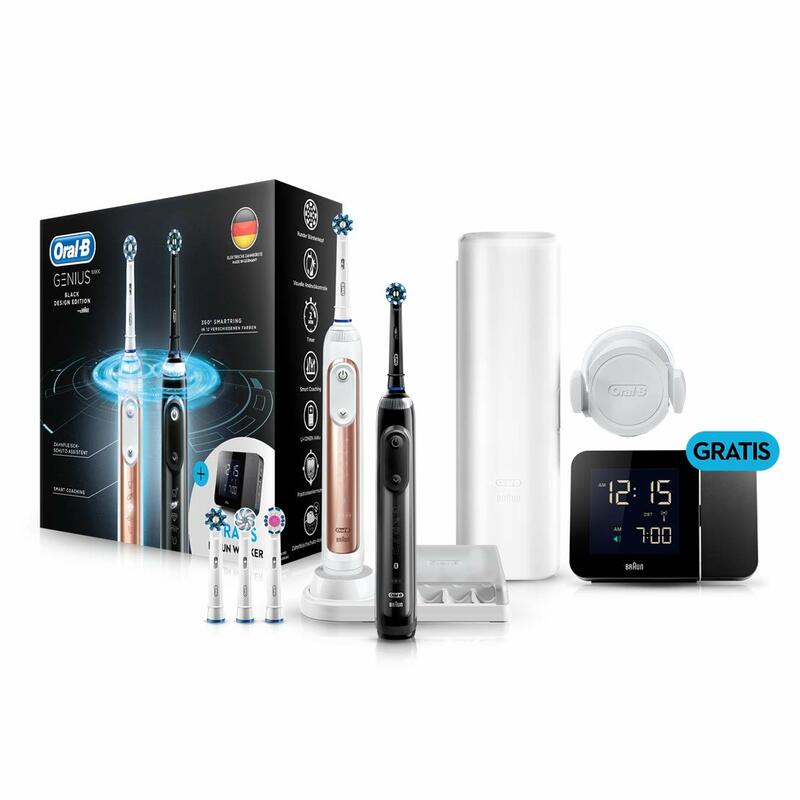 Are you wondering if the 10,000 is better than the Oral-B Pro 7000? If so, please confirm which country you are in as models do vary.